Our pneumatic fittings range from 1/4 and 3/8 Industrial Interchange to ARO 210 Interchange and Lincoln Interchange to Parker Interchange, the ST Series High Flow, Mini Type Quick Disconnect and the Universal Series. Available in many sizes and in stock for quick shipping. We have a large inventory of pneumatic fittings including: Mini Type Quick Disconnect, 1/4 Industrial Interchange, 3/8 Industrial Interchange, ARO 210 Interchange, Lincoln Interchange, Parker Interchange, ST Series High Flow, Universal Series. We also carry a full line of stainless steel pipe, tube and fittings. View our full line of stainless steel tube products. Our pneumatic fittings are available in multiple sizes for all of your pneumatic fitting needs. For more information, view our dimensional data. We stock thousands of pneumatic fittings covering a variety of pneumatic product series in many specifications. Pneumatic fittings are used to connect pipe, tube and hose in pressurized gas systems called pneumatic systems. Pneumatic systems have lower pressure and tighter seals than hydraulic systems. 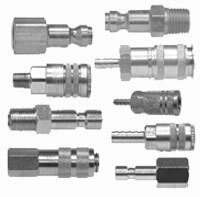 There are many different connection types associated with pneumatic fittings such as thread fittings, both male and female threads, hose barb, push on hose barb and many others. Pneumatic fittings are available in many materials such as steel, brass, chrome plated brass and other.